The GEF Technical Advisory Groups (TAGs) wrapped up a three-day meeting in Washington, DC to discuss the opportunities for GEF investment in the global environment in the coming years. A diverse group of internationally renowned experts met in Washington DC this week to share technical inputs, ideas and insights for addressing the drivers of environmental degradation, and help kick off the replenishment process for the GEF trust fund. 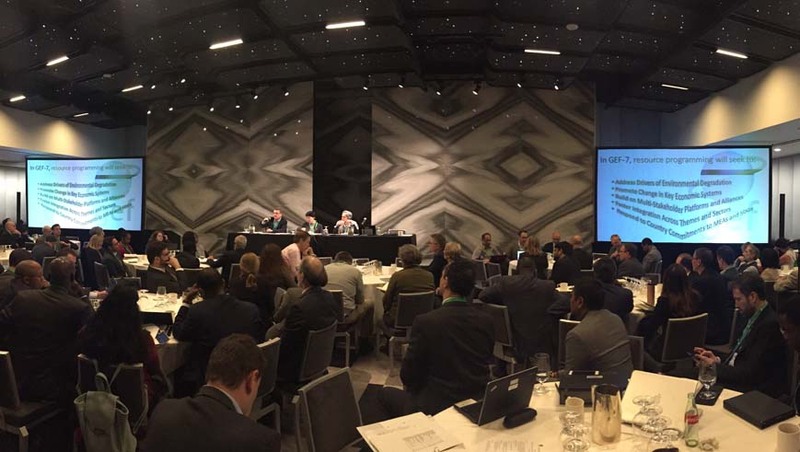 The Technical Advisory Groups (TAGs), spanning the different proposed priority themes for the next GEF replenishment (GEF-7), discussed potential gaps, synergies and suggestions for future GEF investments laid out in a draft programming directions framework. “We’re facing growing environmental threats, but there are emerging opportunities and the world is trying to respond,” said Naoko Ishii, GEF CEO and Chairperson, in her opening remarks to the TAG meeting, which also included representatives from GEF agencies, GEF’s Scientific and Technical Advisory Panel (STAP), Conventions and staff from the GEF Secretariat. “The GEF cannot afford to stand still,” she said, stressing the need for the GEF to transform itself in a way that enables it to tackle the drivers of environmental degradation head on, and set in motion the process requited to transform key economic systems. At its 51st meeting in October 2016, the GEF Council requested the Trustee, in cooperation with the Secretariat, to initiate discussions on the seventh replenishment of resources of the GEF Trust Fund (GEF-7). The replenishment meetings provide an opportunity for contributing participants to review GEF performance and evaluate progress, assess future funding needs, and agree on a financing framework. An important step in this process is the convening of Technical Advisory Groups (TAGs) spanning the different proposed priority themes for the GEF. They TAG meeting, which was held from February 7-9, 2017, discussed a wide range of programming ideas in clusters ranging from land degradation, food security and food systems to energy for all, sustainable cities and climate change mitigation. More clusters looked at other topics including restoration, green financing, biodiversity and the circular economy. Closing the meeting, Naoko Ishii, thanked the participants for their enthusiasm and engagement, noting support for a new way of thinking to both tackle growing environmental risks and seize opportunities to safeguard the health of the planet. “If we do business as usual, we won’t do justice to the GEF mission,” she said. The first official GEF-7 donor meeting will be held in Paris on March 28-30, 2017.